BARCELONA, Spain--(BUSINESS WIRE)--NOWI B.V. the Dutch Semiconductor innovator has been awarded first place, for its work on energy harvesting technology, in the 2019 IoT Innovation World Cup at this years Mobile World Congress in Barcelona. NOWI was selected by a panel comprised of executives from the partners STMicroelectronics, Gore, EBV Elektronik, Würth Elektronik, Gemalto, AiQ Smart Clothing, VARTA Microbattery, Microtronics and Cicor. With a reputation accumulated over 15 years of successful competitions, the IOT Innovation World Cup® Series is no doubt the largest open innovation platform worldwide for IoT and tech solutions. NOWI’s innovative solution continuously brings energy to your device in lieu of wires or batteries. NOWI technology enables companies to use the energy that is already readily available around the device. This can be light, heat, movement or even radio waves. There is energy all around us that can now be converted and used to power IoT devices. NOWI has translated its leading technology position in ‘low-power energy harvesting’ technology into a small chip (integrated circuit) that can be used in a wide range of IoT devices. 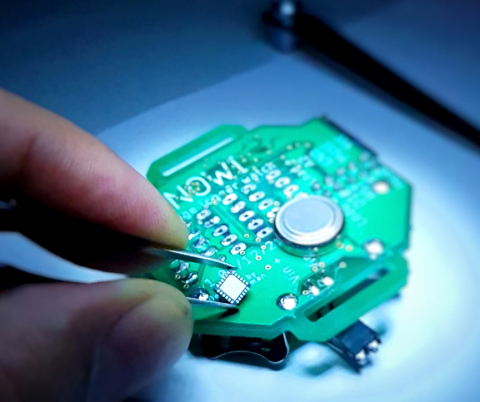 The NOWI PMIC has combined the best energy harvesting performance with the world’s smallest PCB footprint making it suitable for devices as small as wrist watches or very small remote sensors. According to GSMA the leading telecommunications authority, the Internet of Things will reach 25 billion devices by 2025, and as the Internet of Things begins to mature, it has become clear that there are hundreds of millions of so called smart-devices as varied as smart city and wearables, that need to become ‘Plug & Forget’. With the NOWI PMIC this has now become possible for the first time. The advanced energy harvesting development is taking place in Delft Netherlands, the work of a international team made up of business and technology experts from The Netherlands, Brazil, China, Spain, US, Mexico & Iran. The team includes PhD’s with 35 years of research experience in energy harvesting and advanced power management designs. The first NOWI enabled devices, used within an upcoming Swiss watch will be available in Q2 of 2019.